I have recently moved to Ireland and would like to be able to pronounce place names in Irish and make some sense of them. Thanks to the internet, you can hear most Irish place names being pronounced by a local in both Irish and English on the website logainm.ie. 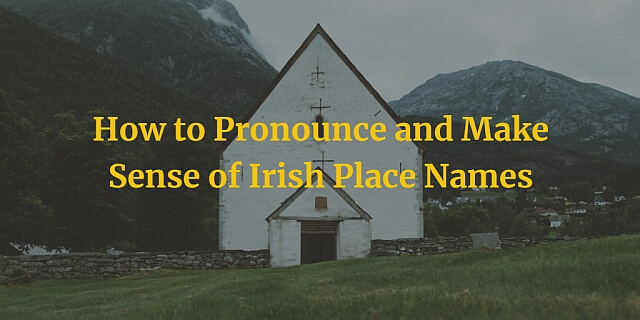 There are many words that commonly appear in Irish place names. Here are a few. Click on the word to hear it. It usually means a place which is physically high but may also mean a place of high importance. It is often followed by a saint’s name. You can learn even more about Irish pronunciation by participating in Eoin’s course Crack Irish Gaelic Pronunciation on Udemy. If you like what you’ve read, why not sign up to free newsletter updates! Simply submit your name and email address in the form which you can find further down on the right of this page. If you’ve ever got any grammar questions, don’t hesitate to email info@bitesize.irish. Visitor question: What if I can only learn with phonetic spellings? This is very interesting! I’m going to visit Bhaile Eachaidh next month, the birthplace of my great-grandfather. I’m grateful that I got to learn the Gaeilge spelling and pronunciation before my trip. Go raibh maith agat! Glad to hear this helped Nancy. Hope you have a great trip, safe travels!